Being someone that absolutely loves book covers, I wanted to find a way to celebrate and recognise them - and so I started African Book Covers, ABC. It is my ode to book covers. African Book Covers has been named a top photo tumblr for those who have any interest in Africa on Africa is a Country's Summer List: Africa Tumblrs. ... this beautiful tumblr where the author has extensively curated the front covers written by Africans, past and present. African Book Covers was mentioned in a BBC Focus on Africa article as "a visual showcase for African literature". 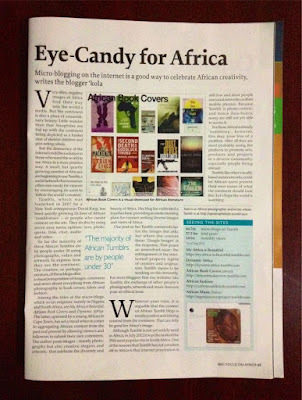 The article, "Eye-Candy for Africa" looks at a small number of Africans using tumblr to "express how they see the continent". 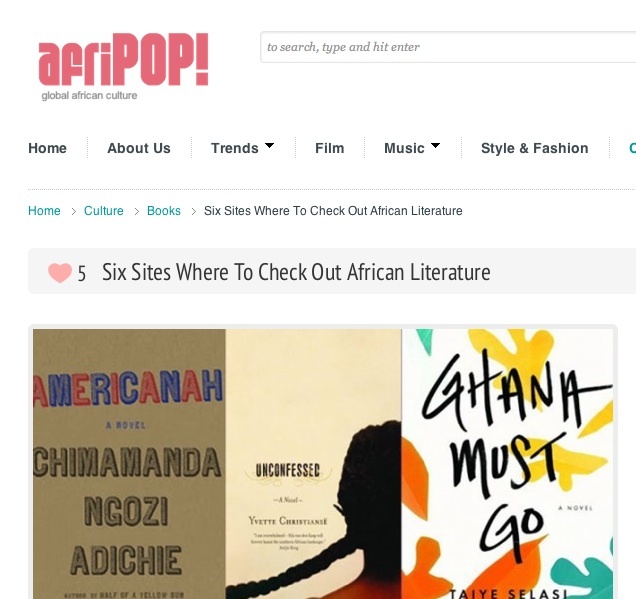 African Book Covers made it onto The Millions "Guide to Artistic and Literary Tumblr's, Part III"
African Book Covers was named as one of the six sites to check out African Literature on afriPop! 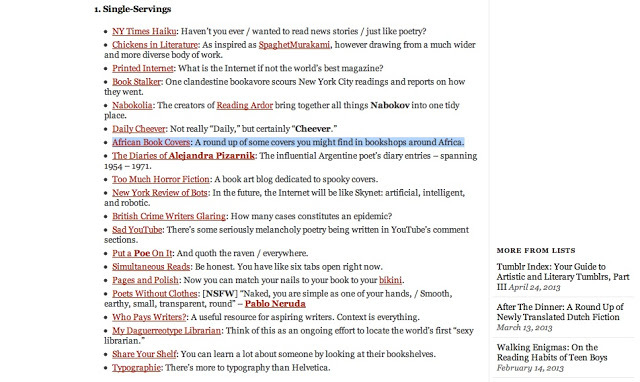 This Tumblr account has been called a "visual showcase for African literature" and we agree! Whoever said don't judge a book by its cover was clearly misinformed as in this case 'a picture is worth a thousand words. I love the book covers you present. Do you know of any book covers or other images of women of color reading. I was looking for some for my new 2013 Challenge and there are lots of images online of white women reading, but none of women of color. I was appalled. Thanks! I've done quite a number of searches on the exact same thing. I have found a few, but not many. There is an image I used for one of my posts, which was a drawing of a woman reading (http://bookshybooks.blogspot.co.uk/2012/09/reading-challenges-and-i-2012-update.html). And I absolutely love this vintage image of an African America women reading a book (http://www.flickriver.com/photos/geldenkirchen/5002064840/). There’s also this one (http://blackfeministmind.wordpress.com/2009/03/16/session-3-black-feminist-west-indian-communist-on-claudia-jones/). When it comes to book covers, the only one I can think of is “True Murder” by Yaba Badoe, but that has a little girl reading. I do have a few more images, but mainly of African or African American women reading, which I could send to you if you're interested? Would you please feature my book cover. I am an author based in Zimbabwe. Loved this idear very much and thanks for giving it life. I once wrote a poem based on the book titles of African Writers Series. Hear Me Angry God is one of my books. It is published in Zimbabwe by Booklove Publishers. It can also be found on the web. If you like it crown it.